I'm writing a program that involves calculating the apparent magnitude of satellites from a ground location. I currently have the intrinsic magnitude of the satellites and the solar phase angle in degrees. I can't seem to find a formula that works. ...but it does not work (it's returning numbers like +30). I know it's wrong because I'm comparing it to heavens-above.com satellite passes. B = This is what I am trying to figure out. In the paper it says what this is but it says some other things that I do not understand. The phase angle you use to get this should be 113. The target output of this equation should be around -3. Congratulations to @NickBrown for his solution! Based on that equation and some additional references I'll just add a little more. For astronomical objects we use absolute magnitude for item #1, for satellite viewing both absolute magnitude and intrinsic magnitude are used. Absolute magnitude is the visual magnitude of the object at 1 AU from the Sun and 1 AU from you, viewed full-on (phase angle = 0) which means you are sitting right next to the Sun. 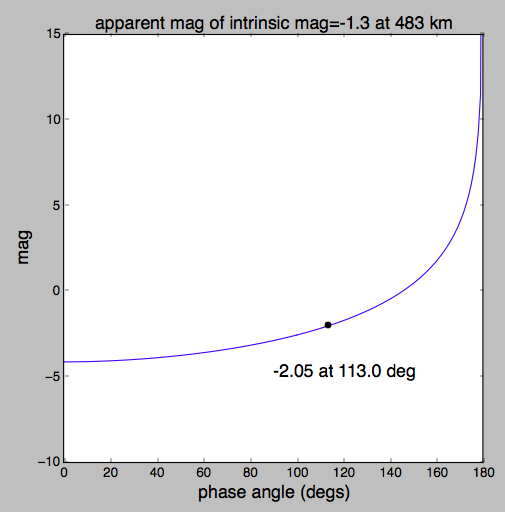 Intrinsic magnitude is similar, but you are now only 1,000 km from the object with the Sun over your shoulder. 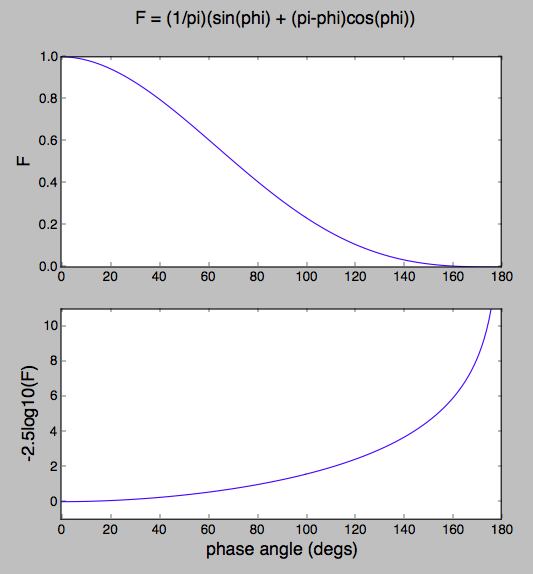 Either way, all of the albedo, size and shape information is lumped into the absolute or intrinsic magnitude, leaving only distances and angles. The angle between the direction of illumination and the direction of viewing is called the phase angle. Think phases of the Moon for example. If the phase angle of the Moon were 90 degrees, it would be a half-moon. Zero would be full Moon and 180 degrees would be new Moon. Not all spacecraft are spherical with diffuse white surfaces nor spherical-cow-shaped. 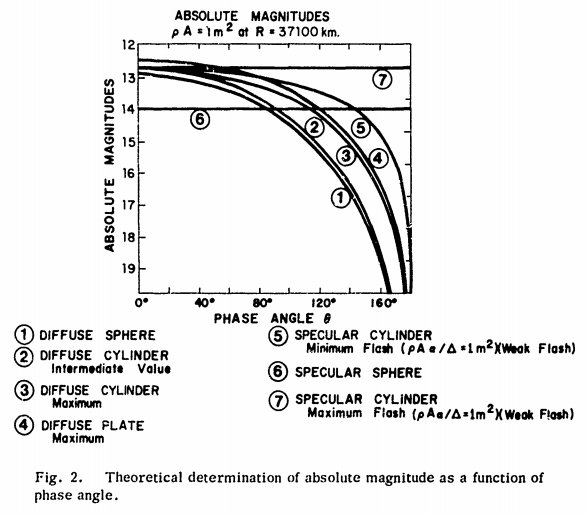 For phase angle dependence of some more familliar shapes, see Figure 2 in Visible Magnitude of Typical Satellites in Synchronous Orbits William E. Krag, MIT, 1974 AD-785 380, which describes the problem nicely. Not the answer you're looking for? Browse other questions tagged satellite artificial-satellite mathematics iss or ask your own question. What is the accuracy of an artificial satellite at a certain magnitude? How much time does the ISS take to repeat its orbit?